It was a really nice hostel! Super clean and cosy, with a nice small garden. The staff was super friendly and helpful. Would definitely recommend to stay here! Sehr gutes Frühstück, nette Mitarbeiter die sich auch sehr gut in der Umgebung auskennen und einem viele tips etc. geben können, schöner Garten und gut ausgestattete Küche, offene Atmosphäre, gutes wlan - alles top, nichts auszusetzen! Un hermoso lugar con buena gente. Me gustó todo: el jardín era lo mejor. La cocina tenía todo que necesitas. Lo mejor desayuno que tenía hace mucho tiempo. Las camas fueron normal. La única cosa: los baños son muy pequeños. Quiero decir gracias al personal del Hostel por el apoyo y las informaciones! 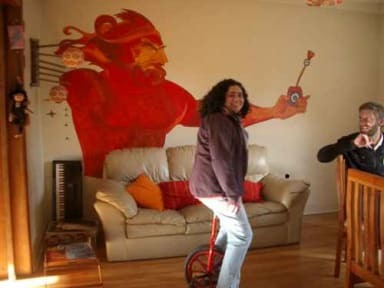 Very comfortable hostel with nice living area and the best equipped kitchen we found in Chile so far. Beds are a bit noisy and mattresses are thin. Clean bathrooms every day! I didn't quite see the permaculture, but the atmosphere is amazing, perfect for meeting people, the breakfast is really good! Nettes Hostel, gute Location, Betten waren mittelmäßig, Garten chillig. Als ich nach dem auschecken noch im Hostel bleiben wollte, war das irgendwie nicht so gern gesehen. Atmosphäre etwas angespannt. Nachts nicht so leise. 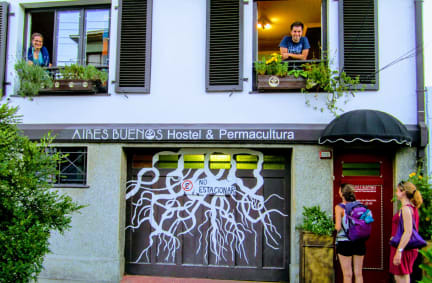 The Hostel is nice and a kind of experience, even if my personally understanding of permaculture differs a bit. It is very nice to be able to inform about permaculture principles there, and nevertheless the relaxed atmosphere is as great as the helpful very awesome stuff. The Kitchen is great and provides all one needs and the breakfast is very good. Many parts of the facility are self made which gives a unique charm to this habitation. For Backpackers i really can recommend it. Nice hostel with an outdoor kitchen which was awesome in summer. Location is good although Valdivia is not really worth a visit. All in all it was a good hostel and I really like their sustainable approach. Everything is really clean and the breakfast is super good with a muesli-yoghurt-fruit mix and dark bread. The staff can be more welcoming/helping when it comes to questions and the big disadvantage is that they have just one shower and two toilets for all dorms and rooms.